This army prefers to engage the enemy at long range, making ample use of rapid firing, high calibre guns and multi-warhead rockets. This Armoured Brigade Box contains 1 x Washington Class Land Ship, 6 x Trenton Class Medium Tank, 2 x Reno Class Medium Tank, 5 x Pioneer Class Small Tank, 1 x Triumph Pattern Reno Class Command Tank, 6 x Yorktown Class Bombard, 4 x Cavalry Token, 4 x John Henry ... <lire la suite>. This army prefers to engage the enemy at long range, making ample use of rapid firing, high calibre guns and multi-warhead rockets. 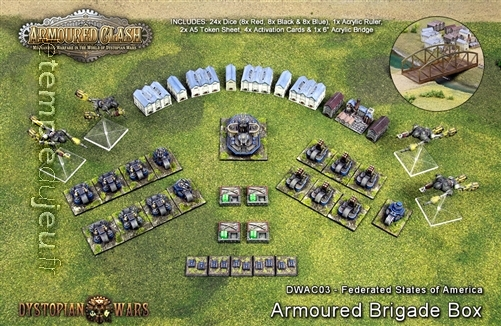 This Armoured Brigade Box contains 1 x Washington Class Land Ship, 6 x Trenton Class Medium Tank, 2 x Reno Class Medium Tank, 5 x Pioneer Class Small Tank, 1 x Triumph Pattern Reno Class Command Tank, 6 x Yorktown Class Bombard, 4 x Cavalry Token, 4 x John Henry Class Robot, 24 x Dice (8 Red, 8 Black and 8 Blue), 1 x Acrylic Ruler, 2 x A5 Token Sheets, 4 x Activation Cards, 1 x Acrylic Bridge and 10 x Scenery Buildings.